Photographer Walter Pfeiffer has created a bold new narrative for Salvatore Ferragamo this Fall Winter 2017, infusing the objects with life in a continuous dialogue of colour and perspective, playing with irony and dynamic motion to make Ferragamo products and the brand’s icons immediately recognisable and fun; in one word: alive. Xiao Wen Ju, Aymeline Valade and Kit Butler are the stars of the new campaign. American fashion designer Brandon Maxwell taps a cast of top models for his fall-winter 2017 campaign. The images were captured by Maxwell as well as his creative partner Jessy Price. Six girls including Romee Strijd, Joan Smalls, Andreea Diaconu, Maria Borges, Charlee Fraser and Lameka Fox appear in the advertisements. The images juxtapose full-length shots with close-up snaps. The models wear tailored suit jackets, form-fitting dresses and sleek capes in the shots. Spanish fashion brand Zara reunites with photographer Steven Meisel once again for its fall-winter 2017 campaign. Rising stars including Vittoria Ceretti, Faretta, Grace Elizabeth, Lex Herl and Aira Ferreira appear in the sleek images. Styled by Karl Templer, the campaign spotlights tailored outerwear including trench coats, knit sweaters and suit jackets. Fabien Baron worked on art direction for the shoot. Michael Kors heads across the pond for his fall-winter 2017 campaign. The sportswear designer taps British model Edie Campbellfor the new season. The blonde posed in the back of vintage car in the glamorous shots captured by Mario Testino. “This season, I was intrigued by the idea of strength and sensuality,” says Michael Kors. “It’s all about bringing out the best in every kind of woman.” For fall, the designer introduces the Bancroft bag. “It’s designed to be a forever bag,” notes Kors. American fashion brand Forever 21 launches its pre-fall 2017 campaign featuring a diverse cast. Personalities from the world of fashion, music and philanthropy star in the studio portraits. Rapper Leaf, philanthropist Lulu Cerone, plus-size model Naomi Shimadaand model and actress Elizabeth Wheeland appear in the images. The new season spotlights denim, hooded sweatshirts and camouflage prints. Italian fashion house Dolce & Gabbana turns up the shine factor with the launch of its 2017 Jewellery campaign. Photographed by Nima Benati, model Giulia Manini appears in the sun-drenched images. The brunette layers up in colorful gems featuring gold wristwatches, floral charms and chandelier earrings. Posing with fresh fruit, Giulia serves pure elegance in each shot. Vera Wang Bridal reveals its spring-summer 2018 campaign starring Italian model Mariacarla Boscono. 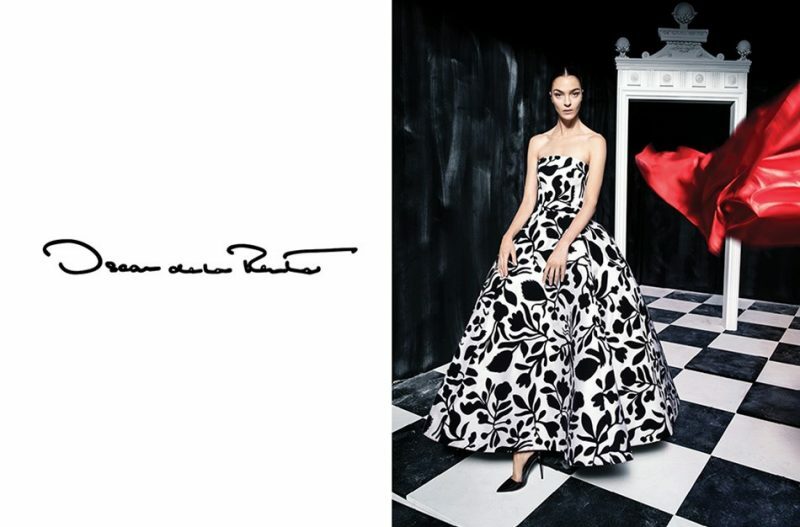 Photographed by Patrick Demarchelier, the black and white portraits showcase gowns from the designer’s latest wedding dress collection. From the sculptural ‘Edythe’ to the form-fitting ‘Florence’, each dress cuts a striking silhouette. Panos Yiapanis styled the shoot with Eugene Souleimanon hair and makeup by Diane Kendal. Italian fashion brand Prada continues to unveil its 365 project with Part 2 of its fall-winter 2017 campaign. Photographed by Willy Vanderperre, the shoot includes three different series. The first called ‘Pièce de Chambre’, stars models Amanda Murphy and Mia Brammer. The second installment titled ‘Affiches’, includes Kris Grikaite and Manuela Sanchez. For the final part named ‘Chiaroscuro’, Freja Beha Erichsen and Sija Jure appear in the colorful shots. British model and actress Cara Delevingne lands her closeup in A|X Armani Exchange‘s fall-winter 2017 campaign. Released today, the black and white shots feature a purely playful energy. Sabine Villardcaptured the images which also star Dutch DJ Martin Garrix and Chinese actor Li Yifeng. In the shots, Cara can be seen wearing a leather jacket as well as a customized eyepatch. Italian fashion house Fendi taps two of today’s hottest models for its fall-winter 2017 campaign. Social media stars Gigi Hadid and Kendall Jenner appear in the brand’s latest advertisements captured by Karl Lagerfeld. The new season celebrates the Fendi ring logo against a white backdrop. Colourful furs, flowy dresses and luxe knitwear shine in the campaign. Sleek handbags and glossy boots also stand out for the new season. Balmain’s Olivier Rousteing turns photographer for the brand’s fall-winter 2017 campaign. After seasons of working with Steven Klein, Rousteing goes behind the lens for a series of black and white images. Top models Natasha Poly and Lara Stone appear in the dynamic shots captured around iconic Paris locations. From Pierre Balmain’s historic home to the Palais Royal, the shots focus on form-fitting designs including cut-away gowns and sequined embellished dresses. 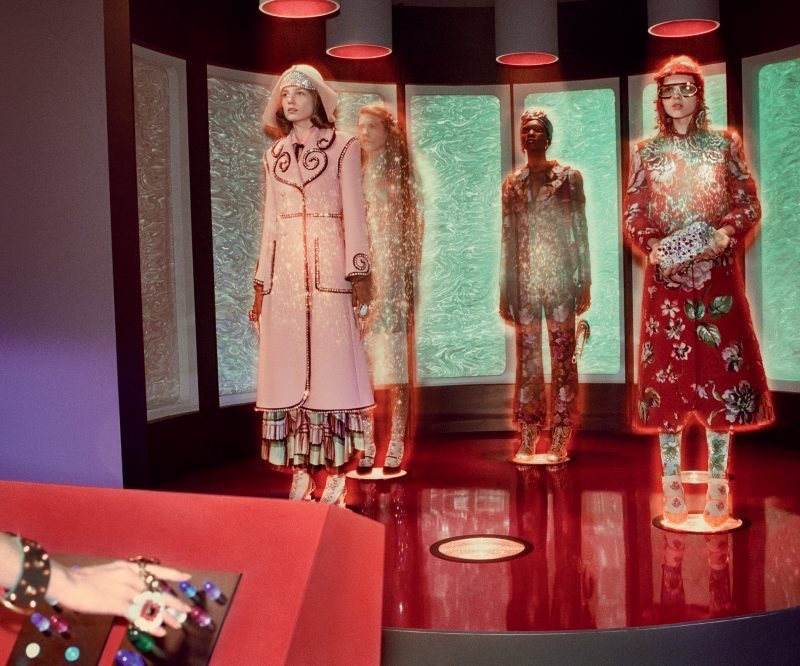 After last season’s ‘Soul Scene’ campaign, Gucci creative director Alessandro Michele looks to sci-fi with the brand’s fall-winter 2017 campaign. Featuring gadgets from ‘Star Trek’ and 50’s B-movie references, welcome to ‘Gucci and Beyond’. The advertisements were captured by photographer Glen Luchford with art direction by Christopher Simmonds. Aliens, dinosaurs, cows and more make an appearance in the fantastical shots. As always, Michele’s eclectic and romantic designs shine in the new campaign. Known for his provocative advertisements, Tom Ford continues to push the envelope for his brand’s fall-winter 2017 campaign. Photographed by Mario Sorrenti, the images star models Binx Walton, Charlee Fraser and Jegor Venned. In one shot, Binx poses in a sequined turtleneck while staring at a naked male form. While another shows Charlee in a black lingerie set with glasses. Discover more images from Tom Ford’s fall ads below. 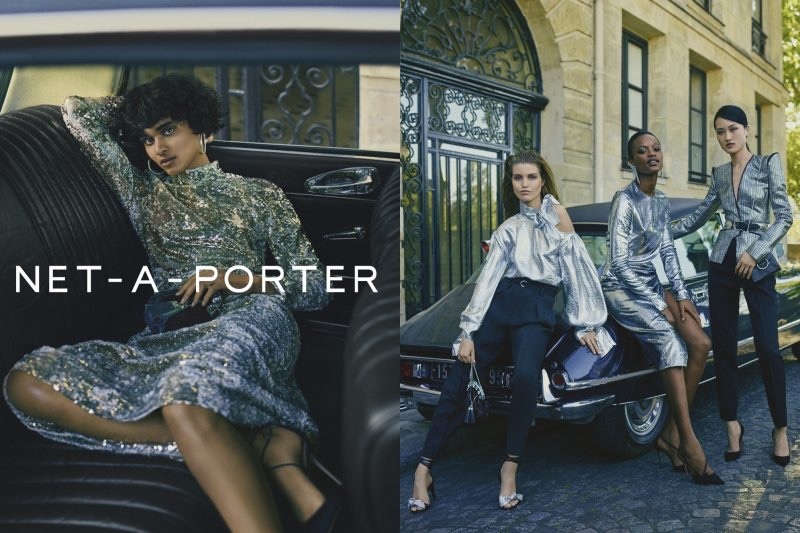 The city of lights, Paris, France, serves as the setting of Net-a-Porter’sfall-winter 2017 campaign. Photographed by Gregory Harris, a diverse group of models including Radhika Nair, Luna Bijl, Mayowa Nicholas and Jing Wen star in the shoot. After unveiling a runway show inspired by the beginnings of hip-hop, Marc Jacobs continued to bring a retro flair to his fall-winter 2017 campaign. Photographed by David Hughes, the images star models Alek Wek, Natalie Westling, Cara Taylor, Kiki Willems, Slick Woods and Hanne Gaby Odiele. Styled by Katie Grand, the advertisements feature a 1980’s inspired vibe including corduroy separates as well as oversized hats and leather bags. Guido Palauworked on hair with makeup by Diane Kendal. BOSS gets cinematic with the launch of its fall-winter 2017 campaign. Captured by Glen Luchford, the advertisements star models Kiki Willems and Hannes Gobeyn. The pair pose as actors in images that mimic stills from a film. Artist Director Jason Wu’s sleek designs take the spotlight with oversized knitwear, tailored suiting and leather footwear. New York-based fashion brand Theory focuses on the essentials for its fall-winter 2017 campaign. Captured by Erik Torstensson, the advertisements star models Iselin Steiro, Sasha Pivovarova, McKenna Hellam, Xavier Buestel and Janis Ancens. The new season spotlights relaxed suiting, leather outerwear and fine knitwear. Finishing each ensemble, short booties and folded bags perfect the looks. Oscar de la Renta tapped famed photographer Tim Walker to shoot its Fall 2017 ad campaign. Creative directors Fernando Garcia and Laura Kim also tapped Mariacarla Boscono to show off their red carpet-ready attire. Also highlighted was the brand’s new rose-adorned bags, one crystal and one a luxe emerald green crocodile skin. The campaign was styled by Jacob K. Garcia and Kim did not make a statement about the new campaign, but it’s their first as creative directors at the legendary house. This entry was posted in Ad Campaigns and tagged Alessandro Michele, Armani Exchange, balmain, BOSS, Brandon Maxwell, dolce & gabbana, Fall Winter 2017, fendi, Gigi Hadid, kendal jenner, marc jacobs, michael kors, net-a-porter, oscar de la renta, Paul Andrews, Prada, Salvatore Ferragamo, Theory, tom ford, Vera Wang, Willy Vanderperre, Zara. Bookmark the permalink.